Arthur de Maine reports in the June 2011 DX Times: Paul was the first to arrive at Tiwai on Friday afternoon at 1.30pm with myself and Frank arriving later on in the afternoon. The first order of business was to raise the New Zealand flag for the last time at the Tiwai site. This honor was given to the Patron Frank Glen. This was done with great ceremony . The next business was to unpack the vehicles and light the coal range and set the fire in the lounge. Then the radios were set up with Frank in the middle room and Paul and Arthur in the second room and then it was down to some DX. Conditions were only fair and a little noisy. Saturday morning saw us all up bright and early at the dials. Dunamis Radio, Uganda on 4750 KHz was logged between 1830 and 1900 hours UTC but conditions were still noisy. The Patron insisted that we carry on with the usual Tiwai tradition of having lunch in the Irish pub in Invercargill. After lunch we met Steven at the gate and upon arrival at the house Steven set up two EWE aerials on the west side of the house. After tea contact was made with Ray Crawford via amateur radio on the 40 meter band. Sunday morning saw the flying mailman wake us all up with his banging and crashing in the kitchen. The comment was made that it was most usual for him to be up so early at Tiwai. Frank left us straight after the photo shoot in the morning as he was heading to Cromwell and only had a leave pass for two nights. Steven also left to go into Invercargill to start painting a flat in town. Arthur and Paul were left to charge batteries and general tidy up and clean out cardboards. Conditions again on Sunday night were not the best. 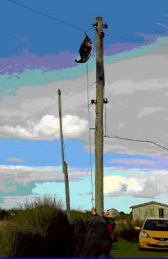 Sunday evening saw Steven rig up the switchboard so that the house lights could be run off the generator. Monday saw the best morning of the whole week for African reception with a number of stations noted in the log. not perform very well and there was also electric fence noise. Wednesday saw us head back to Tiwai and the task of dismantling long wire antennas and removing poles commenced. This continued through to Saturday when Paul and I departed Tiwai. Steven departed Friday morning. For me it was sad to depart Tiwai for the very last time. I had been visiting this famous listening site regularly since moving to the South Island in 2003. The departure was made worst by the very disappointing reception conditions on Mediumwave and the lower Shortwave bands apart that one morning. In all I really do have some happy memories of DXpeditions to Tiwai and the DXers that I met. The stories that were told around the fire some nights when DX was slow still remain in my memory. My thanks to Steven, Frank and Paul for their company during that last week at Tiwai. Steven Greenyer writes: “My first visit to Tiwai was in late 1974 and April this year was to be my last. The previous 36 years have provided many happy hours of DXing and socialising. Unfortunately this year was to prove very disappointing for MW DX. In fact I do not recall such an extended period of patchy DX. I arrived on 2 nd of April and left on the 8 th. At this time of the year it is not unusual to hear MW signals [from the Americas] as early as 0230 UTC, this year it was not until around 0500 that both Latin and US signals came up. Latins faded quickly after about 0700 while Yanks lasted to around 1000 hours especially on the X band. While some of the signals peaked overall reception was sporadic. This year I erected two EWE antennas and once again realised the value of a low gain amplifier at the antenna rather than at the receiver end of the coax. I also took the time to experiment with one of the EWEs. The benefit of the EWE is its rejection of signals off the back end, the disadvantage of DXing at the South of the country is that the EWE looks through NZ when aimed at the US, so its ability to reject signals is of no use. As the EWE has a reasonable amount of pick up off the side I erected a EWE back to front, that is rejecting NZ and US stations in the hope it may pick up Latins. The rejection of NZ stations was very good. What was very noticeable was that with no NZ signals reception of Australians dominated the frequencies. Had the conditions been better I have no doubt that a similar situation would have happened with Latins, for example it was noticed that the Latin on 1010 kHz was unreadable due to splash on the forward looking EWE, while on the reversed one it was in the clear. Steven Greenyer’s eulogy to Tiwai (May DXT) reminds me of an opportunity I recently had to bring the demise of the fabled listening site to the attention of a conference audience in the USA. I was attending the (April, 2011) Popular Culture Association (PCA) convention in San Antonio, Texas and was both surprised and delighted to hear a young US academic speaking on the subject Disembodied Voices and Dislocated Signals: The World of Modern-Day DXing. The presenter was not a DXer himself, but was involved in Greek language ethnic radio in the USA and had received listening reports from DXers. This led him to an interest in the field and to undertake an academic overview of the hobby. His discourse was fascinating and I found myself nodding in agreement with most of his research findings. In terms of ‘what was DXing’, he indicated that both the amateur radio aspect of the hobby and shortwave/broadcast band listening could be included in the definition. On the subject of gender, he told us what we already know, namely that DXing is largely a male-oriented hobby, that 85% of ham radio operators are male and that an interest in the hobby is often passed down from father to son. During the Q&A session after the presentation, I took to the floor and outed myself as a DXer, much to the delight of my academic friends and colleagues. I indicated that I fitted some of the ‘stereotypes’, but that he would have to ask my wife about the ‘anti-social’ aspect. I then told the conference of the demise of the famous Tiwai listening site. I recounted my own experience in having visited Tiwai (sadly, on only one occasion) and I also paid homage to the many top-class NZ DXers who had made so many loggings from the site. I mentioned the NZRDXL as being one of the few remaining DXing organizations still publishing regular magazines and I gave a brief overview of the proud history of our League.